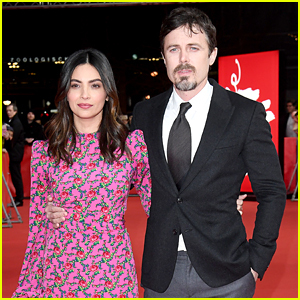 Casey Affleck walks the red carpet with his girlfriend Floriana Lima at the premiere of Light of My Life during the 2019 Berlin Film Festival on Friday (February 8) at Zoo Palast in Berlin, Germany. The 43-year-old actor not only stars in the film, he also wrote and directed it. Casey was joined at the event, as well as a press conference earlier in the day, by his young co-star Anna Pniowsky. The film takes place while the end of the world is unfolding and in a “society without women where gender roles have to be renegotiated.” He says the movie was written before the #MeToo movement and it’s not a response to the resurfaced allegations made against him.